The history of Glenlola Collegiate School is one of change and development; from the beginnings of the small schools for girls in Bangor to the successful large grammar school of the twenty-first century. Our story begins in the Victorian era when the population of Bangor was around 3000 persons. About 1880, “the Ladies Collegiate School” opened in a house in Upper Clifton, Bangor. It moved in 1900 to 12 Grays Hill and in 1919 the Pickie Rock Hotel building was purchased and the School was renamed “Bangor Collegiate School”. There were over 80 private pupils on roll. Meanwhile a school founded by Miss Ruby Harte and her family opened in 1897 originally in Seacliff Road and then in Clifton Road. It took its name ‘Glenlola’ from the house name that the school occupied. Both schools had a strong Methodist background from the Weir and Harte families which were the primary forces behind their development. Each school accepted boarders and both had co-educational preparatory departments. The number of pupils in both schools remained quite small through the first quarter of the twentieth century and the premises on Pickie Terrace were even let out to visitors during the summer months. Under the 1923 Education Act the status of schools changed from privately owned to recognised by the Ministry of Education for Northern Ireland. Under the terms of the Act, finance was granted toward the payment of teachers’ salaries but, as no assistance was given to secondary schools to improve or maintain their buildings or equipment, both schools struggled in and out of debt. It took great fortitude and commitment to keep these places of education functioning throughout the 1930s and 1940s. The post war years saw major changes both to the size of Bangor and as a result of the 1947 Education Act. Buildings could now be financed through Government funding and new facilities appeared on both sites. However, the schools still operated preparatory departments in different town locations. For Bangor Collegiate, it was sited in Avoca, a large house in beautiful grounds on the Princetown Road. In the case of Glenlola School, the Preparatory section was taught in 5 Ward Avenue. In 1950 an approach to the Bangor Collegiate School Board to discuss the possibility of an amalgamation of the two schools had not progressed. By 1955 the Ministry of Education indicated that it was not prepared to consider any further extensions to the Glenlola or Bangor Collegiate sites and that it would prefer to see a new school for girls in Bangor. It was eventually agreed to amalgamate, primarily on financial grounds, and to transfer both schools to the management of the Down County Education Authority on 1 August 1957. Sites for the new school were considered and it was agreed to purchase 12 acres in Castle Park for £12,000. Although the decision had been taken and Glenlola Collegiate School came into being in 1957, it still had to operate from the four old fashioned buildings in various parts of the town until the new building was ready for occupation in 1963. These were difficult and testing times for staff and pupils with considerable time taken to move from one building to another. The weekly games session meant that girls had to commute, usually by bicycle from Pickie Terrace to the Valentine Playing Fields in the Castle Grounds. Girls studying Advanced Science either attended the Bangor Grammar School or Regent House in Newtownards. Speech day on one occasion was held in the then Tonic Cinema, Hamilton Road. By the time the new School was built almost 700 pupils were on the roll and a Coat of Arms had been acquired. This was achieved through persistence and prolonged negotiations as Arms were never granted to girls’ schools. History was made when Glenlola Collegiate became the first school of its kind in the United Kingdom to be granted this privilege. 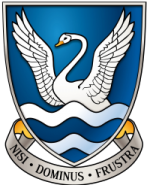 The design and school’s Latin motto ‘Nisi dominus frustra’ (‘Except the Lord build the House’ based on the words or Psalm 127) are now established as the School Insignia. Glenlola Collegiate opened its new amalgamated doors in April 1963 at a cost of £240,000 with 700 pupils and staff. It was designed to blend into the park-like surroundings of Castle Park and to be as unobtrusive as possible! That of course was before the arrival of 26 temporary classrooms and a school population which has reached 1100 with 100 teaching and non teaching staff. Many new activities were now possible and the House system with 6 Houses evolved under the leadership of Miss W.Greaves. Her principalship from 1957 – 1970 saw Glenlola Collegiate progress on many fronts and Mr J. Hagen continued the strong leadership theme during his 21 years as Headmaster from 1971 – 1992. He saw to it with quiet determination that old traditions were preserved while innovations were added to the curricular and extra-curricular life of the School. There was talk already of the need for bigger buildings or even a brand new school and so it continued with Glenlola Collegiate outgrowing its facilities but always retaining its essential ethos, character and level of high academic achievements. Mr R Finlay became Headmaster in 1992 with the clear aims of maintaining and developing all that is positive and proactive in Glenlola Collegiate. New subjects were added to the timetable and school structures redesigned to meet modern requirements. The School celebrated its centenary and was awarded the Charter Mark for Excellence at a ceremony in London in 1997. The campaign for new facilities had led to changes in the Design and Technology and Physical Education requirements, but it was the announcement in 1998 of the then Minister, Mr J McFall MP, that a new 1100 pupil school to open in 2003 on a nearby site which was most warmly received by staff, pupils and parents. A new era was about to commence for Glenlola Collegiate and the School appreciated the considerable assistance, encouragement and support from the South Eastern Education and Library Board. On 28 May 2003, a new school opened to provide a new quality in girls’ education. The official opening was performed by HRH The Duke of York on 8 October 2003. For the first time the entire school population of 1200 girls and staff could be accommodated in one building which, aside from modern classrooms, laboratories and resource bases, contains a sports hall, a lecture theatre, fitness suite, assembly and gym halls, a library, a Design and Technology suite and separate locker rooms. ICT provision exists in all teaching rooms and exterior playing surfaces are floodlit.